IF YOU’RE PICKING UP RIGHT WHERE WE LEFT OFF IN THE MARCH 2019 ISSUE, YOU KNOW THAT OUR GOAL WITH THIS PROJECT IS TO GIVE NEW LIFE TO A SLIGHTLY OLD DAILY DRIVER YOU MAY ALREADY OWN. We started with a lifted 2WD Silverado on 35-inch tires. The truck looked nice and sounded great, but the ride quality was good at best, and it was lacking quite a bit of power. 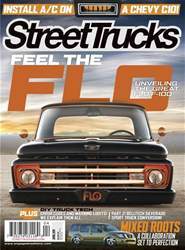 So, we decided to give this truck a complete makeover with sport truck styling and real performance to back it up. In the last year we showed you how simply the front suspension can completely be replaced with coilovers and new spindles from Belltech. We also installed a new beefier sway bar that is included in their Sport Suspension kit. This new set up will bring our previously 7-inch lifted truck down to around 3.5 inches lower than factory stock height.